Topical corticosteroids (steroids) are a wondrous group of drugs that have helped mankind rapidly decrease inflammation in the skin and have resulted in helping to improve conditions ranging from eczema and psoriasis to allergic contact dermatitis and dandruff. Steroids widely range in potency from very weak (e.g. hydrocortisone) to very strong (e.g. clobetasol – over 1000 times stronger). When these topical agents are carefully used for the short term, they are useful adjuncts to therapy. But, things may go quite wrong, when used on the wrong condition, wrong location, or wrong duration. For instance, topical steroids may appear to help fungal infections, but they actually suppress the body’s ability to fight the infection and make it worse. 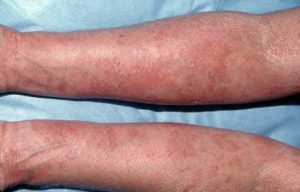 (Figure 1) Other diseases, including impetigo and rosacea, may appear temporarily to get better, as well, but these conditions are likely to become worse. Therefore, minor irritations can be well treated by topical steroids, but the wise patient understands what he or she is treating. The weakest of these agents, over-the-counter hydrocortisone in the United States is required to be labeled with a statement to the effect of: “stop use if condition worsens, symptoms persist more than 7 days or clear up and occur within a few days.” This required warning is well founded. Figure 1: Tinea infection (ringworm) made worse with the use of a topical steroid. When used too long on any skin or in sensitive sites such as the face, breasts, or groin, they tend to cause thinning of the skin. This thinning takes the form of stretch marks (striae), (Figure 2) prominence of blood vessels, and skin fragility. Although stopping the drug or switching to non-steroid products can reverse thinning, stretch marks and other effects can last a lifetime. Figure 2: Stretch marks (striae) induced by a potent topical steroid.